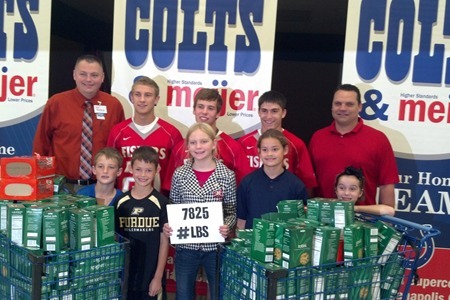 And the grand total is…7,825 pounds! That’s the amount of pasta that will be making its way to seven local food pantries in the coming weeks. It’s all part of PastaBowl, a joint effort between the HSE Schools Foundation and HSE school families to raise hunger awareness and build critical food donations for Hamilton County. The final collection numbers were revealed Tuesday in a joint announcement by the HSSF and Meijer, this year’s PastaBowl sponsor. Many Hoosiers would not typically think of Hamilton County as a hungry place. Yet a recent Indianapolis Star article reported that nearly 12,000 children in Hamilton County struggle with hunger. Hamilton Southeastern Schools has observed this fact as well, through an increased need for free and reduced lunch support. And when students are hungry, it’s hard to learn. Eliminating this barrier to learning is the driving purpose behind PastaBowl. When asked his thoughts on PastaBowl, HSE School Board President John DeLucia noted, “It is a fun way to bring the school community together to make a difference for the Fishers Community.” Exactly! Working together to solve real community problems–part of the HSE21 mission. The mission of HSE21 is to equip students with the content knowledge, unique skills, and new literacies they will need to contribute positively in their communities and succeed in the 21st century global economy.